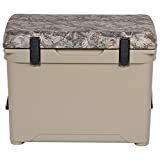 If you’re a serious camper or you’re going on a long camping trip, a fisherman, or any kinds of outdoorsman or woman, you’re going to want to look at rotomolded coolers to make your outdoor experiences even more enjoyable. Unlike a standard cooler a rotomolded cooler is designed to keep ice frozen for a very long time, and will also protect your food items from wildlife and forest creatures should anything stumble across you as you camp and go about your leisure activities. The rotomolding manufacturing procedure ensures that the cooler is made with thick walls throughout and that there are no imperfections that could jeopardize your perishables. These coolers are designed to take pretty much any degree of abuse imaginable, including extreme handling from grizzly bears! A cooler like this is made to last a lifetime, so although they are expensive, buying the right one means never having to buy a cooler again. They are a great investment, providing you put your money in the right place. For those who are worried that these coolers may harm the animals if part ingested – fear not. The coolers are made from elements that will not harm any animal. Animal and outdoor lovers rejoice – the coolers here are the rotomolded dreams you’ve been looking for. 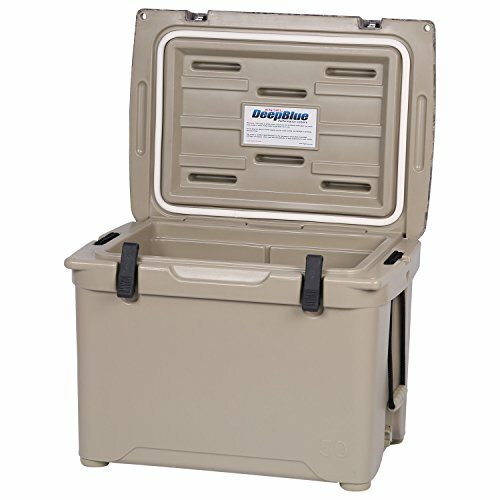 These types of coolers are a must for the fishing, camping, tailgating, and action sports enthusiasts alike. We’re going to give you 3 reviews of high end cooler brands, including Grizzly, YETI, and Engel, so you know exactly where to put your money for the best experience. We’ll look at all kinds of elements, from important things like the ice retention and even the color options you can purchase. You can be sure that by the end of these reviews, you will have found the best rotomolded cooler for you! First off we’re reviewing the Grizzly 40 quart rotomolded cooler. This robust and attractive cooler comes in a variety of colors, including orange, khaki, blue, and neutral. Whether you want to blend in or stand out, there’s a color here that is perfect for you. The Bear Claw latch system gives a secure grip without hardware, and a lifetime warranty is also offered by the Grizzly company. You can’t argue with that! That’s right – the Grizzly cooler doesn’t have cons that we can list here. The cooler receives many compliments wherever you take it, and it’s not too heavy to carry. The cooler is comparable to, if not better than some Yeti coolers on the market. It’s cheaper, and can easily handle several days ice retention. It’s the most affordable of the 3 coolers in this post, and what’s more, it’s made in the USA, ensuring quality craftsmanship for each and every cooler. You really can’t go wrong when you choose the Grizzly 40 quart rotomolded cooler. The Engel Coolers high performance ENG50 rotomolded cooler is a quality cooler that comes in a couple of neutral color options, including beige and white. The white color is not great for dirt, so it’s probably best to select a different color if you plan on taking the cooler camping. The cooler offers good ice retention; usually around 3 days of solid retention. However, you need to make sure the latches are properly shut with enough tension. Do the paper test and see if you can pull the paper out. If you can, then the latches need to be adjusted until there is more tension and the paper doesn’t move at all. Although the Engel rotomolded cooler definitely has some fans, there are a few drawbacks with this cooler model. Some would say that for the price, 3 days of ice retention is simply not enough. For others, 3 day of retention is plenty. It all depends on what you’re willing to pay for that level of retention. Many coolers come with a basket as standard, but this cooler does not. The design is attractive, however. If you’re a fan of the Engel brand, then this cooler may serve you well in spite of the drawbacks. 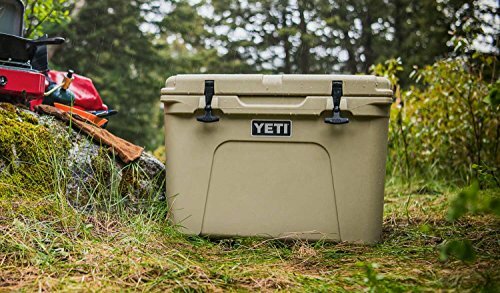 Pretty much every outdoors person knows the Yeti brand, as they have been producing robust coolers with a hype around them for years. This YETI Tundra 50 cooler is available in 3 colors: blue, neutral, and white. It is the most well known brand on the list, and also the most expensive of the 3 coolers. However, just because it is the most expensive and the most well known, doesn’t mean that it’s the best. The drain plug can drip frequently, which can be annoying. Ice retention tends to be pretty good, but is comparable to cheaper rotomolded coolers. That being said, the cooler is very durable, and could be a good option for fans of the YETI brand. It’ll look brand new after many uses, providing you pick the right color. If you’re not a fan of the YETI brand, then you might want to avoid splashing out on this one, there are cheaper alternatives to the brand. This model is not necessarily worth the extreme price tag, as the models are mostly foreign made. The only way to ensure you get a model made in the USA is to go to a store and check each and every YETI cooler for a sticker. Although this cooler isn’t terrible, it perhaps doesn’t quite live up to the hype and price tag surrounding it. Many people hype up the YETI brand, and there’s no denying that they do make some great coolers that do what they say on the tin. This model still has lots of fans; it just isn’t the cooler with the most pros on the list. If you have your heart set on a Yeti cooler, then this is still a good option to go for. However, for those who just want a great rotomolded cooler and don’t care about the brand name, you could get a great cooler for a more affordable price! Which is the Best Rotomolded Cooler of this Bunch? We think that the clear winner of these 3 high end coolers is…drum roll…Grizzly! 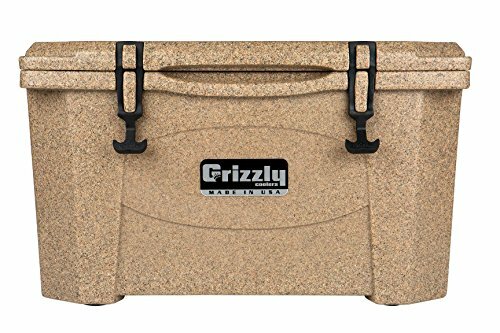 The Grizzly cooler has everything an outdoorsman could ever want in a cooler. It’s super attractive and robust, easy to carry, offers great ice retention, is made in the USA, and best of all, has a lifetime warranty. With a lifetime warranty, you can hardly argue – especially since the Grizzly is actually the most affordable of the three coolers! If you want a great cooler that will literally last a lifetime and do everything you want it to do and more, this is the cooler for you. Now, onto the runner up. It’s been tough, but we’ve made a decision. The Engel gets the runner up place! We understand you may be surprised, so why the Engel over the YETI? Well, Engel is also a more affordable option than the YETI, offering comparable, if not better ice retention. Providing you choose a darker color, the color should stay looking new for a long time and serve you well throughout your many adventures. What can we say about the YETI? As the priciest option on the list, you would expect more from the YETI than it has to give. Buying one of these coolers can be a hit or miss experience – will it be made in the USA, will it not? Some buyers do not trust foreign construction, and want the capacity of the cooler to be in USA terms, but you cannot always guarantee where your cooler will come from once purchased. If you do manage to get a USA made cooler, then sure, it might just be the best thing you ever buy. However, it’s a risk! Which of these coolers are you thinking of purchasing? We know that you can’t go wrong with the Grizzly 40 quart option – the lifetime warranty says it all. Enjoy! I don’t mean to be disrespectful; this is an awful review. I’m not sure about Grizzly but Yeti and Engel and much nicer than this review points out. The ice retention on Engel is 8-10 days and the latches are specifically designed for folks on rafts or boats to seal great and also open easily. The Yeti sports a smoother finish than Engel and has a 3″ lid vs the 2″ Engel lid. The thicker lid on the Yeti provides greater ice retention. The Yeti also costs slightly more and has slighter better ice retention but the Engel has more interior space, adequate ice retention, and latches easier in my opinion. I have read many reviews of Engel latches failing but many more reviews of happy Engel customers. The latches are readily available and for a long rafting or camping trip probaby smart to buy a spare and throw in first aid kit. The Yeti rubber t-straps provide a more secure seal but take some elbow grease to open. Both are great choices. 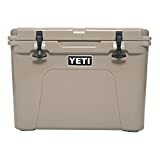 I don’t have experience with Grizzly so can’t comment but I have Orca coolers and they are more a cost effective solution, still pricey, very simlar to Yeti, USA built and come with a cool and robust whale tail T-straps, and also have a back pocket for storage. The final coolers to mention are Rtic, a complete rip off to Yeti but very similar and literally half the price. The Yeti is definitely nicer but you are buying a cooler. I think of an Rtic like a Kia or Hyundai, definitely still a great cooler but totally a rip off of Yeti as those cars are rip offs of Toyota and Honda.